The "Choose activities" window allows you to choose a set of activities. The choice is made via the check boxes. The buttons next to the activity list allow you to quickly add or remove multiple activities. 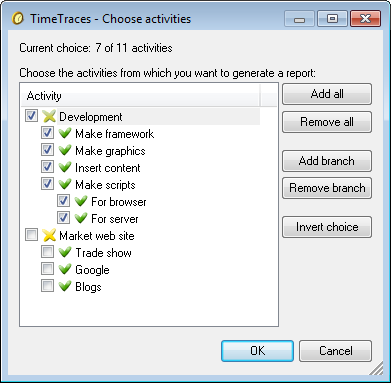 The "Choose activity" window is used by the "Generate report" window, the "Import project" window and the "Export project" window. All the available activities in the project. Check an activity's check box to choose it. Key combination "Alt + B"
Add all activities in the selected branch. Remove all activities in the selected branch. Show the "Choose activities" window help page.